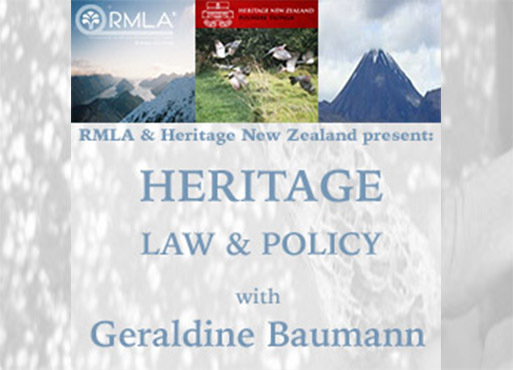 Heritage New Zealand’s Senior Legal Advisor, Geraldine Baumann, has traversed nine locations across New Zealand over the last three months to deliver her excellent Heritage Policy and Law Roadshow. For those who didn’t manage to catch it, here is a quick overview of the key points she covered. Going right back to the basics, an archaeological site, as defined by the Heritage New Zealand Pouhere Taonga Act 2014, is any place in New Zealand (including buildings, structures or shipwrecks) that was associated with pre-1900 human activity, where there is evidence relating to the history of New Zealand that can be investigated using archaeological methods. A shipwreck can constitute an archaeological site, with the caveat that the wreck must have occurred before 1900. Heritage New Zealand does have the authority to declare a site that is not pre-1900 and a good example of where it has made such a call is the Norwegian whaling base on Stewart Island, which is both pre-and-post-1900. Because treasure hunters were known to be damaging the site in their hunt for souvenirs, the whaling base was designated and is now preserved as heritage site. Several old mining areas have also been designated archaeological sites for the same reason. It came as a surprise to several attendees at the Auckland Heritage Policy and Law seminar that the Heritage New Zealand Pouhere Taonga Act (HNZPTA) had been updated in 2014. HNZPTA makes it unlawful for any person to modify or destroy, or cause to be modified or destroyed, the whole or any part of an archaeological site without the prior authority of Heritage New Zealand. While the Act was recently revised, very little has actually changed, says Ms Baumann. “Most of the content has not been updated, and the language remains unchanged”, she noted. What has changed, is that the new Act places more emphasis on the interests of the land owner. In other countries it is often a requirement that a site, having been assessed for archaeological significance, must then require a permit to work there. This is not the case in New Zealand. While New Zealand’s law precludes landowners from tampering with an archaeological site, the onus is on the landowner to request authority to undertake earthworks that may modify or destroy an archaeological site. Heritage New Zealand cannot demand a landowner or developer to seek such authorisation; however, if no authorisation is in place and a site is modified or destroyed, the owner or developer may be prosecuted. Heritage New Zealand has no real power to demand that an owner change its plans for development; it can only decide whether or not to grant an authority for the development to proceed, explained Ms Baumann. According to Ms Baumann, on average 496 out of every 500 requests for authority to develop a site are successful. Only four or five are refused; the rest are mediated, or compromises are found. Once an authority is granted, the developer is within its rights to destroy any archaeological site that may be uncovered, irrespective of its rarity or value. Unfortunately, this happens more often than not. There is, however, one compelling case where a developer altered its plans to incorporate heritage into its development plans and in doing so, built a unique and priceless feature into the building’s design. In Wellington’s Taranaki street, just south of the well-known Irish pub, Molly Malones, a two-storey retail premises built in 1899 was bought by a developer for demolition. Having obtained the authority to demolish the structure, the developer proceeded to knock down the building only to discover elements of Te Aro Pa, comprising structures made out of Ponga trunks that dated back to the 1840s. These are the only known examples of such structures on mainland New Zealand. In order to preserve Te Aro Pa, the developer decided to forego building an underground carpark and foundations, instead preserving the structures with plastic resin and making them a feature of the building. As part of the compromise the Council allowed the developer to build extra storeys to compensate for the foregone basement space. Heritage New Zealand’s remit was further defined in a ruling earlier this year that required New Zealand Heritage to pay a substantial amount in court fees when it lost a case to Greymouth Petroleum over withholding authority to install an exploration drilling platform in Taranaki. As a precautionary measure, the company sought an archaeological authority and consulted with Iwi, who said that the valley held significant cultural significance as an ancestral burial site where, among others, the famed Maori warrior Chief Wiremu Kingi was interred. In light of the potential for the burial area being adversely affected, Heritage New Zealand did not grant authority to Greymouth Petroleum. As reported by Maori Law Review, the Environment Court first considered whether the HNZPTA allowed HNZ to consider the effects of a proposal on an area wider than that included in the application, or whether it was restricted only to considering the particular archaeological site physically affected. Having analysed the relevant provisions, the Court concluded that HNZ was not correct in its determination, and that the wider cultural landscape should not have been considered. Rather, HNZ’s decision should have related only to the physical integrity of the site that Greymouth sought authority to modify. The Court went on to rule that even if it was proven to be the site where Wiremu Kingi was buried, the distance of the burial site from the proposed exploration well meant that there was no appropriate basis on which to decline the authority sought by Greymouth. So who can deal with cultural landscapes? According to Ms Baumann, the protection of landscape sits within planning processes such as those under the Proposed Auckland Unitary Plan. District planning has the advantage of seeing the ‘bigger picture’ and in this respect, can look at the avoidance. In other words, it can suggest workable alternatives, and have a dialogue under the Plan to avoid potential damage to Heritage sites. The Maori Heritage Council is one of two governance bodies of Heritage New Zealand, the other being the Board of Heritage New Zealand. The new Act boosts the role of the Maori Heritage Council, which is soon to publicly launch its Tapuwae, or formal statement of their view of Maori heritage and their policy for its protection. The New Zealand Heritage List, Rārangi Kōrero (‘the List’) identifies New Zealand’s significant and valued historical and cultural heritage places. Continued under the HNZPTA, the List is maintained by Heritage New Zealand. The difference, however, is that Under the Historic Places Act 1993, one of the purposes of listing was to lead to scheduling under district plans. This is no longer the case. Now, under the HNZPTA, local authorities need not pay any attention to listings except for listing of Heritage Areas. When it comes to key planning decisions, Heritage New Zealand is involved in every single one; however, only to the extent that it submits on proposed second generation plans and plan changes. It also aims to work closely with local authorities to shape policies that support these. For as long as Geraldine Baumann has worked for Heritage New Zealand, a Heritage Order, which provides for the protection of the heritage qualities of a particular place or structure, has not been successfully placed on a heritage building. Heritage New Zealand did unsuccessfully attempt to place a Heritage Order on the Jean Batten building. Under the RMA, if the subject of the order can prove that they will incur economic loss directly resulting from an order, then the Heritage Order won’t stand up, she explained. Furthermore, because the heritage protection agency must either buy the building subject to the order or withdraw the order, “heritage orders are things of the past”, explained Ms Baumann. “Most heritage protection agencies are not funded to purchase buildings and certainly not Heritage New Zealand”, she noted. To access the full presentation notes, please click here.